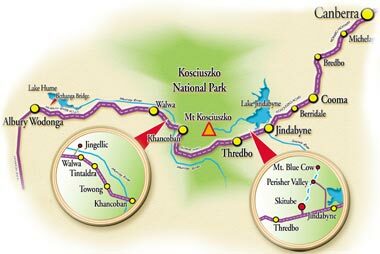 We went back to Melbourne from Jindabyne by Alpine Way. This way is known as one of the best drives in Australia. Well, it might be, but since it was once a cattle trail the road is very narrow in many areas and skirts many high cliffs that has probably done away with many an inattentive driver over the years. Luckily for drivers the road has a number of scenic lookouts and rest areas. We stopped at some of the lookouts (e.g. Scamell's Lookout) and near the SnowyHydro Information Centre. We spent almost 4-5 hours on this way (Google was saying that it will take only 3h), so be prepared and ready for an unexpected delays. One of the rest areas. Stayed there for lunch to give a rest to our's car brackes. To get Scamell's Lookout, follow the signs, as this lookout is not on the road (you have to drive to it for 200-300m). Further along the road Murray 1 Power Station & Visitor Centre is located. Visitors centre explaining the Snowy Mountains Scheme. It is closed weekends from May to September, it was open when we were there, but as we had to get Melbourne as early as possible, we didn't visited it. The Snowy Mountains scheme is a hydroelectricity and irrigation complex in south-east Australia. The Scheme consists of sixteen major dams; seven power stations; a pumping station; and 225 kilometres of tunnels, pipelines and aqueducts that were constructed between 1949 and 1974. We made a stop in Bright (which was not on our way at all, but we are explorers :) and after a while went back to Melbourne.